-Sage is especially upsetting to a cat’s digestive system. It can result in an upset stomach or central nervous system depression. So don’t give them turkey stuffing. -Bread dough when in its raw form reacts with the pets body heat and will rise in the pets sensitive stomach. This will cause bloating and pain as well as vomiting. It can become life threatening and can require surgery. -Cake batter contains raw eggs which can cause salmonella infection in your pet. It also contains too much sugar. So letting your pet lick the bowl is not a good idea. -Too much of anything is not recommended. Even small amounts of human food can result in stomach upsets, diarrhea and, in some cases, pancreatitis. Pet owners should also follow this idea of eating in moderation. There are always leftovers to be enjoyed the next day. -Wraps, wax paper and foils are to be avoided. While licking up the food from these wrappings, your pet may ingest some of the wrappings. These can cause intestinal obstruction so they should be kept separate from the food. 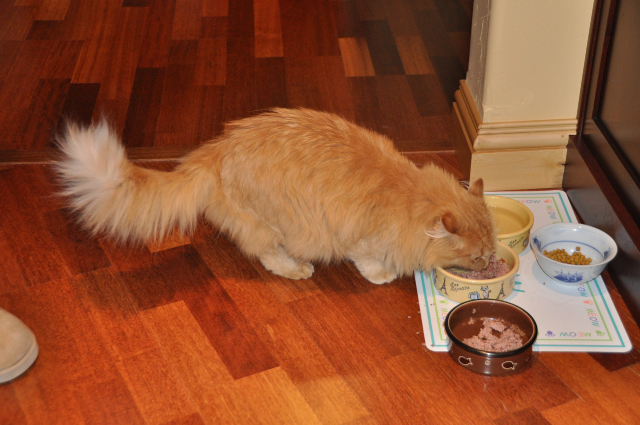 -Hot food carried to the table can be a hazard with pets who are eager to have a taste. Be sure your pets don’t cross your path on the way to the table or weave between your legs causing the food to spill on them. -Chocolate or beverages containing caffeine are toxic to pets. It is best to keep them out of the pets way and serve only to pet owners. Keep these ideas in mind as you enjoy your holiday feast. Wishing you a very Happy Thanksgiving! 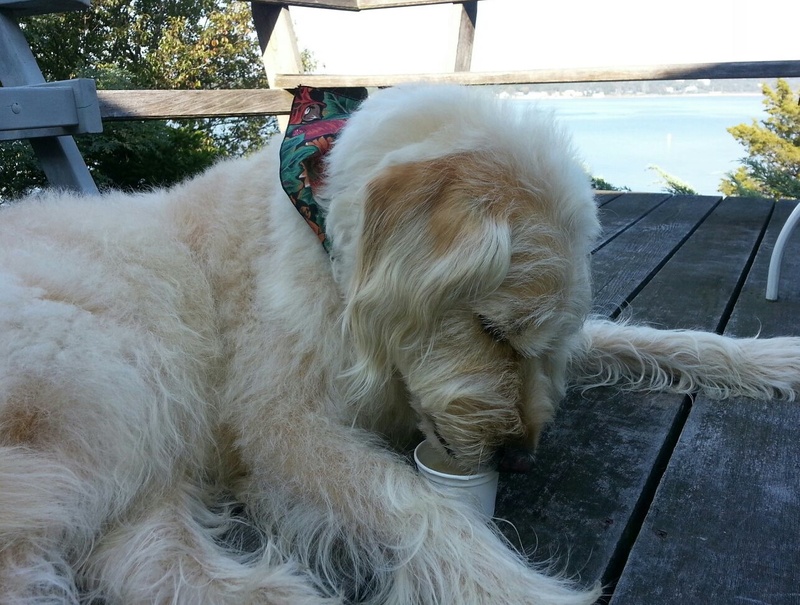 Most dogs will quickly lick a cone to the bone if filled with a scoop of vanilla ice cream. There are commercially available frozen dog ice cream treats. But many per owners are put off by the long list of ingredients that don’t sound like food. And, they are not cheap! Mix these in a blender and freeze in silicone cupcake trays, dixie cups, or in cupcake liners in a regular muffin pan. You can also substitute fat free vanilla ice cream for the honey. For a fun topping to your dog treat, freeze some shredded carrots, cut green beans and/or cranberries. Your dog will lap the treats up with his homemade ice cream. And you will know you are providing him with a healthy, additive free frozen treat. Pets like the freedom to come and go as they need to. Walking your dog or letting out the cat is not always possible. Many of us work outside of the home for 8 hours or more. There are companies that for a fee will come to your house to walk the dog or let the cat out. But if that is not in your budget, pet doors make a wonderful solution. Pet doors also put an end to late night trips to the door and allow you to get a good night’s sleep. 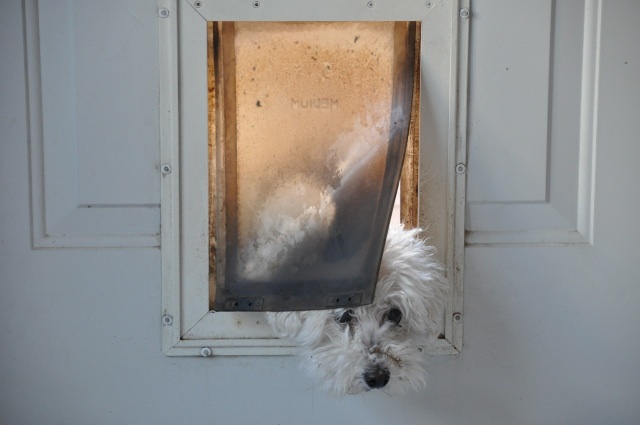 There are many types of pet doors on the market. The power pet doors are fully automatic with motor driven panels. A sensing device, which can be ultrasonic, is mounted on the collar and the pet activates the door. The signal works when the pet is on a direct approach to the door, not just wandering near it. Doors with magnetic or infrared collars do not work this way and may cause false openings of the panel. Many are made with a bullet-proof polymer which is more reliable than those made of metal. The high end power doors come with a wall panel that allows you to open the door manually. They have sensor controls that allow you to turn on or off the inside and outside sensors. That way you can set the door to “in and out access”, “in only”, “out only” and “closed and locked”. The panel also allows you to adjust the exact distance at which the door will open from the inside or outside. Once the pet has moved completely through the opening, the panel closes. They are safe for children as the panel is lightweight and will automatically retract if it encounters an obstruction during closing. Costs depend upon the size of the dog and can range from $300.00 to $1,000.00 or more. Flap doors require the pet to push the door-flap open that is mounted on the door panel. They can be used in a sliding glass door, wall or window. Some work with magnets on the flap which cause it to reconnect with the flap frame after the pet goes out. They are usually weatherproof, chew proof and easy to install. Your pet can be easily trained to use the door with you standing on one side and offering a treat. Some doors have flaps that can be replaced when they no longer close properly. They also come with a sliding panel that can be inserted to prevent the pet from going out or coming in; as well as keeping out unwanted critters. The costs of these devices ranges from $10.00 to $200.00, depending upon the size of the dog opening. So get that extra night of uninterrupted sleep and know that your pet has the ability to come and go as he likes. It is worth the investment!